Here's a different trem set-up than the one we featured recently by Galeazzo Frudua. Between the two we can discover some valuable insights, and hopefully find how to make hi-performance trem adjustments easier to confront & more workable. To supplement the above video you've GOT to check out this TGP discussion about Verheyen's approach! Be ready for several pages of helpful technical explanation combined with an almost equal dosage of clusterf#*k, thanks to a now suspended know-it-all who keeps calling the set-up "snake oil" in spite of everyone who says it works and loves the result. It seems like Mr. K-I-A is the only one who doesn't at least TRY IT; instead sticking to his fixed idea of why it's unworkable-- like a friggin' pit bull too-- while at some point even mentioning that he sets up Strats all the time. Well alrighty then. Blah Blah Woof! Woof! But fortunately, beyond the typical forum meltdown scenario, sanity prevails, AND we probably should even thank Mr. Suspendo K-I-A (eagle1) for bringing out a number of savvy guit-technoids who patiently provide plenty of helpful tips in support of Verheyen's approach. So, it's a win-win! Listening to Carl's Jeff Beck bend examples provides some real meat & taters too! I can already tell by the sound that JB & Scott Henderson must be applying a similar trem set-up. 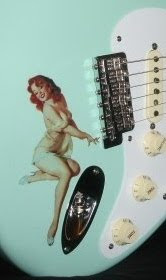 When my Tele is back from some upgrades, I'm gonna fiddle with this on the Strat. Don't think it's a real rocket science thing though. You're simply shifting some of the tension load over to the low end until those pull-up intervals start to emerge with the G,B & hi-E. I think they simply do this with a little patience and experimenting. Just keep it floating, and look closely at the claw angle, screw proportions and spring extension in the video by pausing at the rear view section! I'll report back with my own results, and in the meantime anyone should feel free to comment with their own experience on this. BUT ONLY IF YOU TRY IT! Pimp Your Strat! - More tips, tricks, mods, upgrade parts & suppliers!